The Class has adopted the Winglets as a defacto production feature. I contacted 'Winglet Guru' Andrew Landenberger to tell us how he ended using them & Gonzalo Redondo from D3 Applied Technologies for some tech data. Latest boats offering factory Winglets are: Andy Scheurer G6, DNA, new Addiction A, new Exploder A, Bimare Zero, new D3 and I'm sure I'm missing some. The new Olympic boat, the Nacra 17, use the proven A-Class curved board setup heritage, as this development comes from their Nacra F20, and those boards were built by Nils Bunkenburg, builder of the now legendary Nikita Acat, the N17 is currently reported on being quite fast, 24knots in 17knots true wind, but it has some unexpected power lifts making the boat going almost vertical. So I'm sure the Olympic sailors would benefit from the great development being done in the A-Class with rudder winglets to stabilize their ride and get an even faster boat, thus providing a better prmotion for Multihull racing. - Rudder winglets are almost standard in the Aclass now, which is main technical benefit and reason of having them? 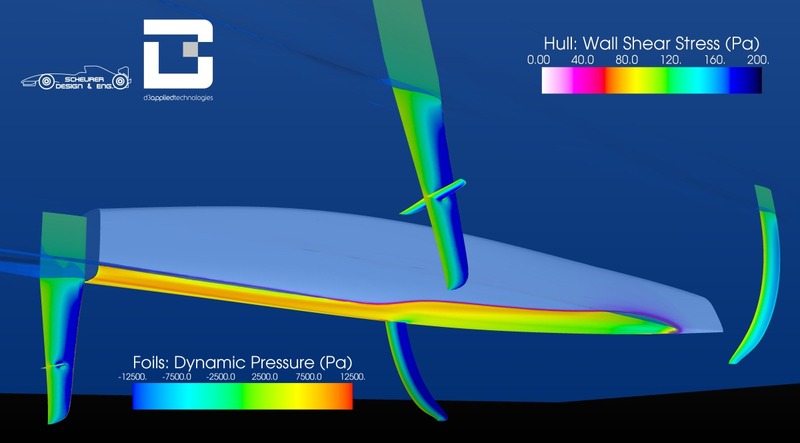 GR: The effect of rudder winglets is to improve dynamic stability. I think everybody knows now how they work as they are becoming more and more familiar. When the bow climbs up, the rudder winglets increase their angle of attack and by applying an upward force at the transom they bring the bow down again. When nosediving, they apply a downward force and bring the bow up. It is similar to an airplane elevator. Disturbances to pitch stability are not only wave related, they could come from gusts, bad manoeuvrings, etc. At high speeds, even in calm water, the boats become pretty nervous and so the rudder winglets give you that extra control. - AC72 have T rudders for full foiling, which is the main diff with winglets? They are the same regardless of a T or cross configuration. If there is a difference, it is just the area. - Recent N17 videos show a high power lift from the curved boards, and I proposed to add a set of winglets to control that extra power. Which would be the effects in your opinion on this kind of boat & setup? I really like the Nacra 17 as well as having mixed crews. I think though the limited crew weight will be a great handicap for some of the best Tornado / F18 / A-Class sailors. Moreover, due to the weight distribution, female skippers are obviously favored. 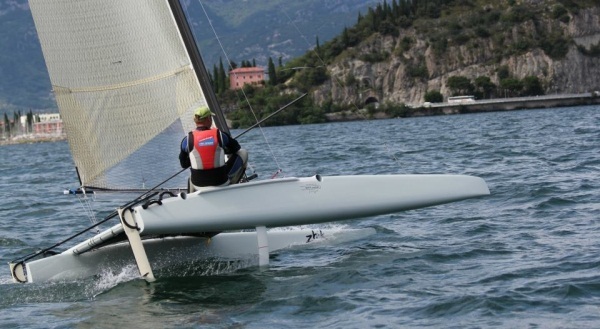 Regarding the winglets, it would certainly be a nice and cheap feature for the Nacra 17 class, if not for this Olympics I believe winglets should be included for the next one, the same way the 49er rig was updated before. The boat would be more tolerant to disturbances and way more forgiving downwind, which seems to be the current issue as shown by the videos. I believe the sailors would like it as a more forgiving boat meaning their campaign is not risked on every wave. - You are using Winglets in your D3? We are indeed. Depending on the rake setup, the boards will provide more lift than standard boards, therefore we have increased the area of the winglets by about 10% compared to the previous winglet Dominik was building. Moreover we are extending the span which has let us improve the aspect ratio and reduce the chord at the tip, changes that will reduce induced drag. Also, they will be placed 85mm lower as it is more comfortable and stable, to sail with port and starboard winglets in the water. - How the project is going, launch dates? As of today it is all sent for construction. I would say quite soon, given we would like to be in the Europeans with a proven platform. I hope we can test it in previous races. We have done our best to design a fast A-Cat, but as usual it will be proven on the water if we are right or we need to adjust it. Anyway, the boat pushes a bit further some of the design features that now are standard, but it is still quite conservative. The boards can be preset for a "standard" mode, so in this case not much difference with curved boards is expected. "There has been a long History with Winglets for me. Many years ago I was Moth World Champion and very involved in the class development. One of my strongest competitors was a guy called Roger Angel from the UK. He was also multiple world champ in the Class and one of the leading innovators. Roger showed up to a World Championship at Germany in 1991 with a boat he named the 'Skippy'. This was a hull with a very narrow stern with two fins attached to it resembling a dolphin. I recognised the advantages and went straight home and started to work on the idea. I started with a T foil arrangement just in front of the rudder which worked very well but slowed the boat in the tacks. The next step was to mount the foil on the bottom of the rudder. Within two seasons every Moth had a T foil rudder. 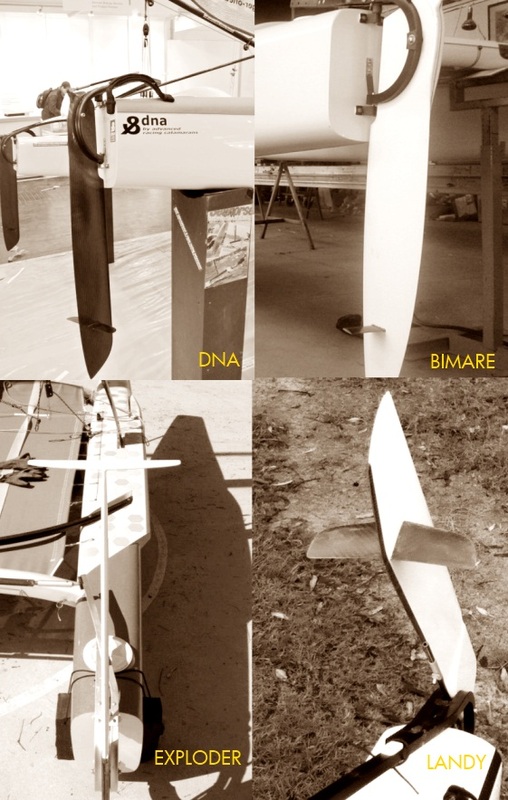 In that time I was moving my focus to Olympic classes, but my brother in law "Ian Ward" was already developing the first foiling Moth. This took a little longer to catch on in the class, but it was his development which lead the way to current Moths. Ian is still heavily involved in foiling boat development and is currently working on some rather special projects. In 1997 just after the Olympics I bought an old A Cat to attend the Nationals. It was an old boat and I was in it for a laugh but the first thing I realised was that I could add the winglets to the rudders. So I sailed the the 1997 A Nationals with T foils on the bottom of my rudders. I was basically laughed out of the boat park but I can still remember Jim Boyer saying to me one day " I just can't understand how you can go so fast with that old boat"... My response was "It's the rudders" - He replies "Not possible". I came back to the A Class in 2005 for the first time, but until 2009 I was just borrowing boats. It was still hard to get anyone to build the foils for me and as I had little time outside of the loft it did not happen until about 3 years ago, when Andy Scheurer listened to what I had to say and immediately produced a test set of rudders for me. I have been using the same set of rudders in every major competition since. After all this time people only now start to realise the advantages. It has been interesting to watch. I only wish I could have recorded some of the comments over the years - It would be great to be able to play them back now..."
Needless to say, Landy made those winglets perform without drawbacks and in 2012 he won the Europeans and was second in the 'Hurricane' Worlds at Isla Morada, only behind Mischa Heemskerk using the same Winglets conf. He is also working on some special additional developments.